Social media is turning out to be a powerful tool in helping young journalists to practice their craft, as a group of 22 students learned when they covered the winter Olympic Games last February. The team, which also included three faculty members and one journalism alumnus who works for the Spokesman-Review, showed up in Sochi from Ball State University with not a single press credential among them. Yet over the course of a week the "BSU at the Games" freelance news agency managed to generate stories and photographs that were read, viewed and shared around the world in outlets that included the Chicago Tribune, CNN, The Huffington Post, the Colorado Springs Gazette and Indiana NBC affiliate WTHR. Here's what worked for them. In September 2013, instructor Ryan Sparrow brought a group of his students to a national media event in Park City, UT, where they had the opportunity to meet and interview TeamUSA's athletes, giving them a taste of what lay ahead in covering the Olympics. It also allowed them to forge relationships with athletes face-to-face -- connections that they maintained via social media after the event. The relationships came in handy when the students got to the Games. They couldn't get press credentials for Sochi, but were able to score tickets to events, giving them entry to the Olympic Park and proximity to athletes. While NBC, which broadcast the Games, had a virtual lockdown on much of the media access within the official Olympics venues, social media made athletes "much more accessible," said Sparrow. In some cases, for example, the students would use their social channels to arrange to meet up with athletes outside of official areas. Connectivity was always a challenge during the Sochi trip. Some of the students had "international" mobile plans for connecting to the Internet, and AT&T let its customers visiting Sochi send text messages for free. Said fifth-year photography student Matt Amaro, "I was not one of those people." His solution was to try to be with someone "who was able to text." However, said Ashley Cox, a junior pursuing a degree in public relations who had an international plan, "Service was spotty." One of the first things the group did upon arrival was to hunt down Russian SIM cards that would work with small WiFi units Sparrow had brought along. Explained Amaro, "Those helped the people who had iPhones, as we were able to iMessage and use social media on the go." Even then, however, the nine-hour time difference between Sochi and Indiana meant no friends or followers would really see the posts until hours later, tempering the urge to do real-time coverage on the spot. "I was in charge of posting on social media and if I had a good enough connection, I posted things from the ground in real time; otherwise I waited until we were back at the ship," said Cox. (To get around the appalling hotel conditions in Sochi, the team had scored a set of rooms on a Greek cruise ship.) Even then, "Internet connectivity was scarce, but it was generally OK, because posting from the ship in the evening (6 p.m. to 2 a.m.) was business hours in the U.S." That timing, added Amaro, was when "most people back home would see our posts and respond to them." After an article in The New York Times and an ABC interview about the "stray dogs of Sochi" went viral, BSU reporter Kourtney Cooper picked up the story and profiled a volunteer group's efforts to rescue stray dogs and cats. That one was published in USA Today College. Reporter Ryan Howe took on the topic of gays in Russia, following President Vladimir Putin's approval of a bill that classified pro-gay statements as crimes. Howe's article and Amaro's photos profiling a drag club in Sochi appeared in The Advocate and have been "liked" on Facebook more than 600 times. Amaro was one of four photographers to make the overseas trip. 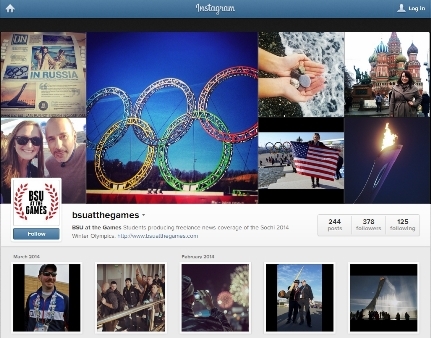 He turned out to be a "stickler" when it came to tagging the photographs distributed by BSU at the Games through Instagram and Twitter, including identifying the Olympians or celebrities when those opportunities surfaced. His reasoning: When the subjects would see their pictures online, "they'd like it [and] share it. It just gets around faster." Many of the stories, photographs and video captured during the Games were posted to BSU at the Games, a WordPress blog that acted as a public repository for some of the work done by the students. That included nine compilations of photos, 39 articles and four videos, as well as work done before the Games. These entries shared observations about food, souvenir opportunities, architecture, the Sochi locals and anything else that inspired the students. That same site acted as a clearinghouse for stateside clients seeking unique Olympics coverage for their sites or pages. It also promoted the news service by providing contact information for its media relations managers, two public relations students who helped the journalists find mainstream homes for their content. Posting BSU at the Games content to Facebook (1,303 likes), Twitter (1,353 followers), Instagram (375 followers) and Pinterest (16 followers) allowed fans to stay in touch no matter which social site they preferred. All of the content from Pinterest was pulled from Instagram, and much of the material from Twitter and Facebook were shared at both sites. The Instagram feed, said Sparrow, turned out to be the "best social media outlet." The original idea, recalled Sparrow, was to use the Facebook channel as a "behind-the-scenes look" at what was happening with the Russia group; Twitter was going to be used as a way to promote the team's content. "But the end result was a bit mixed in that way," he mused. "Finding a voice on our social media outlets has probably been one of the biggest challenges we've had, and I don't feel like we've done it quite right yet. When you are both acting as a promoter of your content as well as tweeting about events happening or other news, the voices can be mixed." Also, Sparrow wishes the group had been able to do more with micro-video app Vine, since media clients had expressed interest in content posted there to help them "beef up what they were trying to do with social media." That just highlights "the need to have a rock-solid social media plan and voice before leaping in," he said. When their time in Russia was over and everybody was ready to head home, the students and faculty did what came naturally to them by that time: They created a video and posted it to YouTube (and the official news agency blog) to thank people who helped make the trip possible.